Do-It-Yourself Impression Kit will let you make impressions of your ears that will then be used by an earmold lab to produce finished ear plugs, ear molds, full custom earphones or custom hunting hearing aids. The impression material is not durable enough to be used as a permanent product. 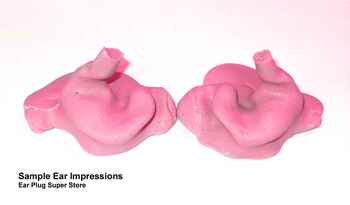 (For a durable do-it-yourself custom ear plug material, see our OCEPS product line.) After using the kit to make your impressions, you will then need to buy the custom product(s) you want in a separate transaction. See custom ear plugs, custom ear molds, custom musician monitors, or custom hunting hearing aids to find the custom product you need. If you need help with selection or have other questions about custom ear products, please contact us during business hours. We will be happy to help: custom@earplugstore.com or 1 (918) 478-5500. If you need impressions for a custom product you are getting somewhere else, our kit is a great opportunity to save yourself some time and money, and we will be happy to sell you the kit you need. With our unique Do-It-Yourself Impression Kit, you can easily, quickly and safely make your own ear impressions for use in fabricating virtually any custom product for the ear, including getting new custom molds for your ITE hearing aids, or even a new custom shell for your ITE hearing aids. Our impression kit comes with pre-measured materials for 6 impressions, which gives you everything you need to make three sets of full ear impressions to help make sure you have enough material in case you need to try more than once to get a good set of impressions. Each kit includes everything you need including detailed instructions with pictures that illustrate each step in the process. You may find it easier with the help of an assistant, but the process really is simple and easy. We even provide a mailing container and pre-addressed label for your convenience in sending your finished impressions to us. However, if squirting goop into your ears is not for you we recommend getting your impressions made by a local audiologist. Our kit is provided as a convenient alternative and we realize it is not for everyone. NOTE: Some audiologists warn against making your own ear impressions, particularly if you have any existing medical conditions. Although reports of injury or any health issues arising from making your own impressions are rare, if you have any concern about the condition or health of your ears or about your ability to make your own impressions, we recommend that you contact an audiologist to get your impressions made. We offer our impression kits as a convenience only, and will happily accept impressions you get from a professional rather than use the kit to make your own impressions.